Dave Steib still # 1, but Roy right behind. My fave Jay of all-time and one of my fave athletes ever. Hands down. If they trade him I am going to barf. By posting this Mike just signed the trade agreement. I will blame you. It is all you. Ricciardi has to go. I don't want him handling this situation. Watched the game in that relatively shaky first inning then turned it off, then his performance solidified, heh. I love Halladay too!! At a BBQ on Saturday I told Mike that he was officially the best pitcher in Jays history. It will be sad when he is inevitably traded in next 7 to 10 days. However, lets understand something right now. We don't know Halladay. We know what he wants us to know. I believe that he wants out of TO. I don't blame him for it. We just didn't get it done around him while he was dominating all these years. In this day in age there are few pitchers that would give us more than 11 years. I hate the Blue Jays management and i blame them 100%. The same competitiveness that has Roy going the distance is what will lead to him going to a treat for the Series. But don't fool yourself. Roy wants out. I just hope that what we get back makes it easier to swallow. "But don't fool yourself. Roy wants out." If I believed this to be the case, it would be a different story. Right now, I'm not convinced this is true. In fact, I feel Halladay just wants to know we've got a plan to compete for a playoff spot next year and the year after. He's looking for a reason to re-up with the Jays. I agree with Mike, his tone in interviews and everything just leads me to believe he'd stay if the Jays were willing to take a shot at the playoffs. Why not trade Wells or Rios to shake up the roster a bit (even though their value is diminishing)? Oddly I think this whole situation is one I'm caring more about than the Sundin Sweepstakes last year, but if the Jays lose Halladay that'll be a serious blow to my interest in the team. Halladay always had that determined, consistent leadership quality that will seriously be missed in this city. In this case though, if Halladay was dealt I think immediately I'd start rooting for that team to do well, especially in the playofs, he's earned it. Ugh, this whole situation bothers me as a lifelong Jays fan. :( If the Phillies got Halladay and another World Series title as a result, would that officially overshadow 1993? What does 1993 have to do with Halladay exactly? 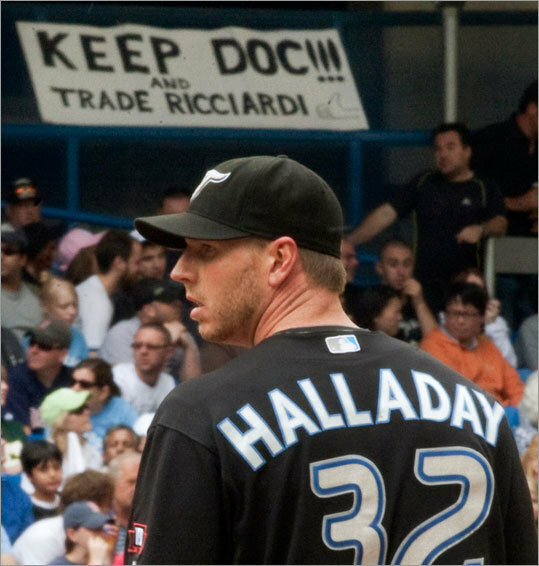 interesting article on today's Fox Sports...perhaps the jays should keep Halladay and get rid of Riccardi...? Sold! That's the answer here. I agree with the sign in the background of the photo... and the above post! Elvis, I meant moreso Philly versus Toronto. I have that Halladay pic as my Facebook profile picture at the moment, it's so damn true though. So JP is now saying (according to TSN) that Halladay likely will not be dealt?! Why bother stirring the pot? If JP was looking for strong offers he would publicly give a deadline and say it's not likely. What did he just do again? I still say he goes. But yes, I hope its JP as well. Level Of Excellence - NOW!